According to a 2005 World Bank report, 98 percent of the population is Catholic, 1 percent Protestant, and less than 1 percent Muslim. Most citizens also retain some vestiges of animistic beliefs and practices, which they have come to regard as more cultural than religious. The number of churches has grown from 100 in 1974 to over 800 in 1994, with Church membership having grown considerably under Indonesian rule as Pancasila, Indonesia's state ideology, requires all citizens to believe in one God. East Timorese animist belief systems did not fit with Indonesia's constitutional monotheism, resulting in mass conversions to Christianity. 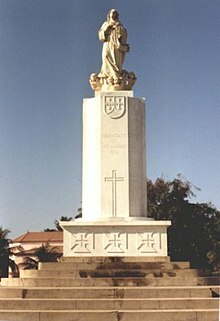 Portuguese clergy were replaced with Indonesian priests and Latin and Portuguese mass was replaced by Indonesian mass. Before the invasion, only 20 percent of East Timorese were Roman Catholics, and by the 1980s, 95 percent were registered as Catholics. With over 90 percent Catholic population, East Timor is currently one of the most densely Catholic countries in the world. The number of Protestants and Muslims declined significantly after September 1999 because these groups were disproportionately represented among supporters of integration with Indonesia and among the Indonesian civil servants assigned to work in the province from other parts of Indonesia, many of whom left the country in 1999. The Indonesian military forces formerly stationed in the country included a significant number of Protestants, who played a major role in establishing Protestant churches in the territory. Fewer than half of those congregations existed after September 1999, and many Protestants were among those who remained in West Timor. The Assemblies of God is the largest and most active of the Protestant denominations. The country had a significant Muslim population during the Indonesian occupation, composed mostly of ethnic Malay immigrants from Indonesian islands. There were also a few ethnic East Timorese converts to Islam, as well as a small number descended from Arab Muslims living in the country while it was under Portuguese authority. The latter group was well integrated into society, but ethnic Malay Muslims at times were not. Only a small number of ethnic Malay Muslims remained. Domestic and foreign missionary groups operated freely. The Constitution provides for freedom of religion, and the Government generally respects this right in practice. Societal abuses or discrimination based on religious belief or practice occur, but they are relatively infrequent. 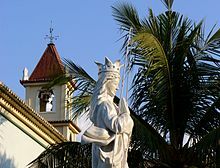 The Roman Catholic Church in East Timor is part of the worldwide Roman Catholic Church, under the spiritual leadership of the Pope in Rome. There are over 900,000 Catholics in East Timor, a legacy of its status as a former Portuguese colony. Since its independence from Indonesia, East Timor became only the second predominantly Catholic country in Asia (after the Philippines) - approximately 96% of the population is Roman Catholic. The country is divided into three dioceses; Dili, Maliana and Baucau, all of which are immediately subject to the Holy See. The Apostolic Nuncio to East Timor is concurrently the nuncio to Malaysia. The current nuncio is the US archbishop Joseph Salvador Marino, and the nunciature is located in Kuala Lumpur. In the early 16th century, Portuguese and Dutch traders made contact with East Timor. Missionaries maintained a sporadic contact until 1642 when Portugal took over and maintained control until 1974, with a brief occupation by Japan during World War II. Pope John Paul II visited East Timor in October 1989. Pope John Paul II had spoken out against violence in East Timor, and called for both sides to show restraint, imploring the East Timorese to "love and pray for their enemies." Retired bishop Carlos Ximenes Belo is a winner of the Nobel Peace Prize along with José Ramos-Horta in 1996 for their attempts to free East Timor from Indonesia. The Roman Catholic Church remains very involved in politics, with its 2005 confrontations with the government over religious education in school and the forgoing of war crimes trials for atrocities against East Timorese by Indonesia. They have also endorsed the new Prime Minister in his efforts to promote national reconciliation. In June 2006 Catholic Relief Services received aid from the United States to help victims of months of unrest in the country. Islam is a minority religion in East Timor. The US State Department and the CIA World Factbook estimate that Muslims make up 0.2% of the population. East Timor's first prime minister, Mari Alkatiri, is a Sunni Muslim. In 2010, the Association of Religion Data Archives reported that according to the World Christian Database, Muslims made up 3.6 percent of the population. It also reported that 0.4% of the population identified as agnostic, and that Buddhism and Chinese folk religion each made up 0.2% of the population. It also reported that non-negligible populations followed the Bahá'í Faith, Hinduism, and Neoreligions, with each group comprising under 0.1% of the population. Prior to Christian and Muslim contact, the Austronesian people of Timor were animist polytheists with practises similar to those seen in Polynesia and Madagascar. A few prominent myths remain, such as the island's conception as an aging crocodile, but in modern times practitioners of indigenous religions constitute a very small minority. ^ a b c d e f g h i j k l m n o International Religious Freedom Report 2007: Timor Leste. United States Bureau of Democracy, Human Rights and Labor (14 September 2007). This article incorporates text from this source, which is in the public domain. ^ Robinson, G. If you leave us here, we will die, Princeton University Press 2010, p. 72. ^ O'Connell, Gerard (16 January 2013). "Pope appoints American as first Nuncio to Malaysia, opens new Nunciature there". Vatican Insider. La Stampa. Retrieved 23 March 2014. ^ "Bureau of East Asian and Pacific Affairs : Asia: East Timor: Nobel-Winning Bishop Steps Down". United States Department of State. September 2005. Retrieved 18 June 2006. ^ "A courageous voice calling for help in East Timor". National Catholic Reporter. 11 October 1996. Archived from the original on 25 January 2013. Retrieved 18 June 2006. ^ "World Briefing: Asia: East Timor: Nobel-Winning Bishop Steps Down". New York Times. 27 November 2002. Retrieved 18 June 2006. ^ "E Timor may reconsider religious education ban". AsiaNews.it. 27 April 2005. Archived from the original on 13 November 2005. Retrieved 19 July 2006. ^ "Bishops encourage new premier in East Timor". Fides. 18 July 2006. Retrieved 19 July 2006. ^ Griffin, Elizabeth (6 June 2006). "NEW SUPPLIES ARRIVE IN EAST TIMOR, MORE THAN 50,000 GET RELIEF". Catholic Relief Services. Archived from the original on 17 July 2006. Retrieved 19 July 2006. ^ CIA World Factbook. Retrieved on 12 December 2015. United States Bureau of Democracy, Human Rights and Labor. East Timor: International Religious Freedom Report 2007. This article incorporates text from this source, which is in the public domain. This page was last edited on 15 February 2019, at 18:21 (UTC).